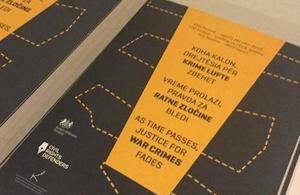 British Ambassador Ruairí O’Connell’s speech on the occasion of the publication of the report ‘As Time Passes, Justice for War Crimes fades’, supported by funds from the British Embassy. Speaking about war, war crimes and the trials of these crimes is not easy. The war created pain and consequences. The war left Kosovo with over 12000 people killed, and 6000 missing persons of different ethnicities and religions, of which over 1600 persons still remain unaccounted for. We are witnesses to the fact that family members of murdered victims seek justice, family members of missing persons want to know about the fate of missing persons, and victims of sexual violence seek for justice. I personally visited Gjakova, Drenica and victims of war in different parts of Kosovo. Allow me to say that I feel the pain with these families who still have no information about the fate of their family members. People remember and it is hard for them to forget injustice and what happened to their families. This is normal, it’s human. Now, 18 years after the conflict, we all have an obligation to help society heal its wounds. For these wounds to heal, we should initially face and hear what happened, regardless of ethnicity or religion. We are all humans and we all deserve justice. As you know his Excellency, the Prince of Wales, visited Kosovo in March 2016 where he met families of missing persons. As a continuation of this meeting, in March this year the Prince hosted the families of missing persons from Kosovo, Croatia, Bosnia and Serbia in London. He was deeply touched by histories told and pledged that he will give his assistance wherever possible. This meeting emphasised the joint suffering of affected families regardless of ethnic origin. I have seen hardship in Cambodia, Bosnia, Syria and many other countries, furthermore I feel it better because I am Irish myself. Ireland is the best example to see that with time, and goodwill we can come to reconciliation and cohabitation. Thus, I understand the difficulties and challenges of this process. Reconciliation should have justice at its foundation. Individuals deserve justice, and the society needs it. The new generations deserve to live in the present, and should not be raised and educated with hatred. There has never been a war without war crimes. The best measurement of a society is their reaction and response in dealing with this matter. And in this respect, Kosovo expressed its willingness in establishing the Special Court as a response towards dealing with clearing its past. Kosovo has proven that it is not afraid to try crimes that may have been committed. Trying individuals for crimes which are suspected having been committed does not change the history or damage the image of an organisation. The manner in which we address such allegations is a measure of the power of democracy and institutions of a state. What no one can do is change the past. However, what we can do is build a better future. The present needs to be built based on truth and justice, regardless of how painful it might be. We need to start speaking the truth and be open to hearing the perspectives of other people. Unfortunately, it is very seldom that you hear people talk about what happened to their neighbours. Did people start to admit what the Serb Regime did against Albanians and others during the conflict? On the other hand, how many people in Kosovo know that out of 1600 missing persons, around 400 of them are Serbs? Therefore, it makes no difference if you are Albanian or Serbian. Justice should be impartial. For example, the Assembly removed one of its members who was convicted for war crimes, while Minister Hoxha initiated an amendment of the Criminal Code and Criminal Procedure Code, which will include an extension of investigation period for war crimes cases. These are good examples which should be encouraged. On the other hand, the ICTY convicted 8 persons for war crimes, of which six are high profile Serbian figures including ministers and commanders and two Albanians. However, if we want to be totally honest to ourselves, we know that this is not sufficient. For solving war crimes cases, judicial institutions should do more. Initially, the prosecution of war crimes should become a priority. We all know that at the Special Prosecution Office there are only two prosecutors dealing with war crimes cases. This shows the lack of a proactive approach in addressing and trying these cases. On the other hand, the findings of the report of the Humanitarian Law Centre indicate that judges do not possess wide experience in dealing with war crimes criminal prosecutions. Knowing the great interest of the media and the public, but also both external and internal pressure, these judges and prosecutors need support staff and above all, specific training. Thus, bearing in mind that so far no training has been organised, I hereby invite the relevant institutions such as the Judicial Council, Prosecutorial Council and especially the Kosovo Judicial institute to organise effective trainings for judges and prosecutors on the criminal prosecution of war crimes. I want to reemphasise that we very well know the history of Kosovo which made NATO intervene in 1999. We are not asking you to forget what happened during the last war in Kosovo, we encourage citizens to seek justice, and we also advise them that the only way is reconciliation and the building of bridges of cooperation between people that live in these areas. You have many examples in Europe, of how the World War II conflict between the people of Europe, with tens of millions of people killed and massive destruction was overcome. The people of Europe knew how to find the path to reconciliation and channelled all their energy into building economic cooperation and improving the wellbeing of their citizens. Let us not forget that Kosovo too is a part of Europe. We believe that this is the right way to be pursued.